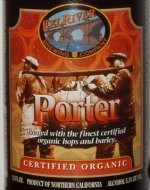 Effusive brown-bodied ruby-tinged porter benefits greatly from hop-charred French coffee roast that overrides lactic mocha-chalked maple sapping and wood-kilned charcoal nuttiness. Frothy cocoa-powdered black chocolate subsidy and sugared vanilla wisp creep through ashen peanut-shelled walnut-chestnut-hazelnut conflux. Clean spring-watered crispness rises above slight astringency. At sturdy finish, burnt coffee souring and lingered anise bittering counter chocolate milkshake-like sweetness. An approachable crossover for dark lager fans.